The mystery of the disappearance of Jean - Francois de La Perouse in 1788 during his long voyage of discovery in the Pacific was solved almost 40 years later, yet it still fascinates people and expeditions continue to search for his body and the remains of his ships. What was it about this man that has exerted such an influence over so many generations?La P rouse was born in the French town of Albi and became a naval cadet, serving in battle against the British in Canada and later in the American War of Independence. He rose steadily through the ranks, with extended periods of service in India, Mauritius and elsewhere in the Indian Ocean. It was during one of these episodes that he met Eleonore Broudou, who would wait many years to marry Jean - Fran ois, only to lose him a few months later when he embarked on his final voyage. The achievements of this Pacific expedition are second only to those of Captain Cook. La P rouse was the first to explore the North American coast of Alaska and California, the first to survey the remote seas near Korea, and the first to venture to the isolated coast of Siberia. Heading south, La P rouse led his expedition to Botany Bay, Sydney, where he spent some time making contact with the local Aborigines, before his fateful voyage into the unknown. It is now clear that his two ships were wrecked at Vanikoro in the Solomon Islands.John Dunmore is recognised as a world authority on La P rouse and French navigation. 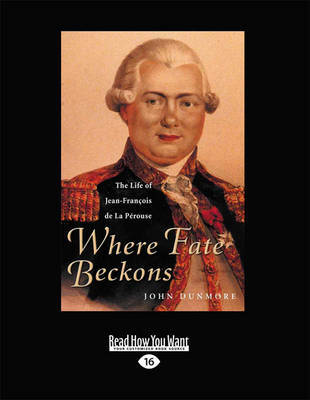 This very readable book not only tells the story of an important and remarkable life but also provides a lively introduction to the world of French colonialism, exploration and society in the years leading up to the Revolution.